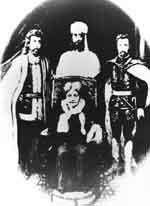 Madame Blavatsky was the Founder of the Theosophical Society. One day she was having her photo taken. As her photographer was developing the film, Ascended Masters Kuthumi, El Morya and St. Germain "showed up" on the film. They were not visible as the photograph was taken. This occurred in the late 1800s. I am Kuthumi and I come forward upon the rays of Love and Wisdom to greet each of you at this time and to bring unto you the blessings of equilibrium, truth, faith and serenity. Greetings beloved ones. Beloved ones you are standing in the midst of yet another level of extraordinary change. The energies that you are magnetically drawing towards you are creating shifts on not only a grander scale but within the minutest fibres of your being. Everything within the microcosm and macrocosm are undergoing change. This is a critical time as we lead all of you into the light of your own power and in so doing assisting you in recognising who you truly are, the you that exists beyond the programming of belief systems that have been fuelled by insecure lower egos. I cannot not even begin to explain to you how extraordinary these changes are, everything that comes your way now is pushing the boundary, it is forcing you to step outside of the mould, to shatter every single belief system that has created a system which feeds inhibition, everything that sustains limitation and fear. During the time of the 20th and the 21st of March the crone energy, whom we also refer to as The High Priestess, is wrapping her energy around planet earth. She is also enfolding each of you in her energy and it is her wisdom that nurtures and comforts you through this time of release, uprising and stepping beyond everything that represents the comfort zone of the structure that you have called life up until this point. The second ascension wave which anchors the full extent of it’s energy on the 21st of December 2008, and will continue to affect humanity until the 21st of December 2010, is coming forth with an energy that may be considered ruthless. There is nothing ruthless about it precious ones, what you are perceiving as ruthlessness is simply authenticity, truth, the real deal so to speak. You have asked that the universe show you the truth about God, the truth about yourself, life and everything that makes up the paradigm that you have become accustomed to as being the life you live in, therefore everything that is and represents the illusion is going to shatter. The shattering moves the shutters away from your heart chakra and the moment the shutters are shattered over the heart chakra, all the chakras beneath it and above it undergo precisely the same process. All the minor chakras in your physical and energetic bodies undergo an incredible symphony of healing. This is part of the Easter ceremony of death and re-birth and isn’t it rather delightful that the Easter celebrations are over the time of the equinox? These energies have been brought together for a very specific purpose. This is an opportunity to ensure that those who are linked to the winter (autumn) equinox begin understanding what the journey of introspection for this period entails. Those of you who are experiencing the equinox of the Northern Hemisphere you need to know what it is that you wish to bring to life. So both are vital. I have said before it doesn’t really matter if you are living in the Southern Hemisphere or in the Northern Hemisphere, you are still affected by both the spring and the winter (autumn) equinox because genetically you are connected to both hemispheres, even if it is on a subtle level you will experience those connections. The crone also known as The High Priestess brings you the incredible power of mysticism, the mysteries of life that elude you, the mystery of self that you are ready to embrace. However, the mystery that she brings is the perceived mystery as a result of her wisdom. Because of her level of wisdom she is a powerful observer therefore the gift she presents you with is the gift of The Wise Observer, the part of you that can choose in any given moment exactly how a situation will turn out. In many instances you will need to use your wisdom to be still, to step back and watch what is playing out around you and wait for the appropriate time to step in and drop the cat amongst the pigeons so to speak. Other times you will be the cat amongst the pigeons, but it is your wisdom that will require of you to play that role. Wisdom is an aspect of unconditional love. A wise one knows exactly when to act and never reacts immaturely and by this I mean in both aspects of that word. The immatureness that I refer to is immaturity on a psychological level and on a spiritual level. I have spoken before of emotional or psychological immaturity that not only impedes but, often temporarily halts a Lightworkers journey, and perhaps it is important that I mention this again for those of you who have not heard me say this before. It matters not how advanced anyone is on a spiritual level. They can be a great teacher, a guru with all the metaphysical, esoteric and spiritual knowledge of the world inside of them but if they are psychologically immature what they have intellectually means absolutely nothing. Psychological emotional maturity is the central core point of maintaining balance. It is the core stabiliser of every soul choosing to walk the path of the spiritual warrior. Ignorant Lightworkers are more dangerous than the average ignorant man or woman on the street that knows nothing about metaphysics, esoterics, philosophy or anything else, so bear that in mind. The High Priestess invites you into her Sacred Chamber of Light where she tempts you to challenge the immature aspects of self. She tempts you to challenge all the areas of your life that you have chosen to be complacent about, turn a blind eye to, turn a deaf ear to and she is enticing you to stir the pot, to bring it to boil because in that place you find truth. The wise master never nurtures an illusion. The wise master stands and observes and knows precisely when to act, the action being the catalyst to shatter the illusion. Please bear this in mind for all your days on earth. No true wise master or being of light or true love who walks the authentic path will ever, ever nurture an illusion, yours or anyone else’s. When you feel instinctively inside of yourself something in your life is an illusion or you know you are in denial about something and your guides or whomever it is you are working with encourages you to remain in denial or nurture that illusion, then you know you are in trouble and best you fire them on the spot so to speak. You are on the pathway to becoming a fully empowered soul in human form therefore every illusion that exists must and will be shattered, you determine how long that process will take. Step away from situations and people that choose to nurture illusions and honour the truth. Be the wise master and observe if you must, otherwise walk your talk and know that when the time comes for those who nurture the illusion to experience something different and they make the choice to experience something different, their feet will find your path and will call to you and you will be in a position to present them with what they need and they will be in a position to accept your offer. Do not ever try and convert those who are not ready, you are fighting a losing battle, just be, live your truth, speak it, be it and everything around you will fall into place. The rise in love reveals to you that every step you take is a revelation in itself and the death and rebirth process that you will shortly undergo is in fact not one there to debilitate you as I have said so many times before, all it is, is an opportunity to bring your attention to what needs your attention. I need to reiterate that it is vital that all of you do not lose yourself in petty irritations and I spoke about this in the message for the recent key date activations a few days ago. Petty irritations are the egos, the lower egos way of distracting you from what is important therefore choose wisely what you will give your power to. When you get caught up in those petty irritations and petty squabbles you are giving your power to it and this time of the equinox, the energy that the crone combined with the energy of The High Priestess bring you is an energy that asks you to rise even higher in love, love for self, love for life. During the energy activations of the 20th and the 21st of March there is another matrix that is being dismantled. It is a holographic projection that has influenced everybody and is influencing children at younger and younger ages. Some children as young as four years-old are already being severely influenced negatively by this holographic insert and this is related specifically to the illusion around the physical body, what it should look like, it’s size, it’s shape and so on and so forth. This has been one of the most debilitating holographic inserts or implants if we can call it that rather that humanity has had to deal with. Everything in the third dimension has brought your attention to focus on externals. The pattern is to seek confirmation outside of your self, to seek approval, love, comfort, nurturing and security outside of the self. Some years ago women were groomed to be the perfect wife in order to catch the perfect husband who could protect her, provide for her and make sure that she was safe. That is no longer the image that you need to uphold, however genetically it is still there. At midnight on the 21st of March we begin pumping the new energy into the DNA codes of every man, woman and child on your planet. This is a planetary and collective DNA flush relating specifically to this hologram that has been created. It will take approximately twelve to sixteen weeks for the implant to completely dissolve and for you to flush out those imprints that lie within your DNA. Some of you have been feeling the affects of this implant because we have already been preparing the energy to remove it. Do you know that when you feel that you are ugly, unlovable, unattractive, fat and all the other labels you give yourselves, you are being distracted, you are being played with like a pawn? Because the worse you feel about the self the more dis-empowered you are, the less love you feel for yourself the stronger your fear is and you become a mechanism that nurtures that hologram, that matrix that I have spoken of. The 21st of March is a time where portals to the dark worlds are closed and there are many. Every year we work with shutting down more and more. The more empowered each of you become the easier it is for us to shut these systems down but it is vital that all of you work with us, therefore I ask you the minute you feel unattractive, unlovable and downright disgusting remind yourself that you are being toyed with. The beauty of your soul, your heart and the light that you emanate is so much more powerful than the looks of a physical body. Yes you are all working towards reversing the aging process. How long that will take is debatable. In the meantime you must nurture that inner spirit, that inner quality of light and of beauty. There is an exercise we want all of you to perform and this I suggest you do with everyone that you know. Every person you know needs to sincerely write down everything about you that is beautiful, nothing to do with your physical body, the you, that inner soul quality. What is it about you that attracts them, that keeps them in your space and you are to do the same with them, this is to be a joint project and those of you here please ask this channel to make this a worldwide project for everybody to do this. It is not just limited to the group we are working with right now. The more you feed the light of self, not the ego, we are feeding the light of self, the stronger you become and that inner glow shines through. You have felt it in yourself, you have seen it in others - there is just something about them, that is what we are wanting you to connect with, to focus on. That is what will nurture the love amongst all of you. The crone offers you the offering of not only wisdom, not only maturity, but the treasures of self discovered and owned. The crone in the form of The High Priestess knows exactly what she is capable of. She has pushed the boundaries, she has explored, she has ventured into realms where perhaps only fools will tread and in so doing she has learnt about herself. Let me at this point say I am referring to a her because of The High Priestess and crone archetypes, but she exists within every man as much as she does every woman. Embracing her energy will accelerate the process of recognising the treasured qualities that you as yet have not owned. I assure you when you move beyond the surface and exteriors and you penetrate the depths of the true essence, the wisdom, the light, the power and the love that exists within every soul, transformations beyond your grandest imaginings will take place. Your energy will shift and change, the way you feel about yourself and life will change dramatically. The way you see yourself, the way others see you will also be very different and in that space by that I mean in that frame of mind. In that space of love you will be utilising the powerful “magic” in inverted commas of quantum mechanics. There is a science to everything. The scientific fact is that energy exists everywhere. Energy can never cease to exist. It is transformed or transmuted but can never not exist, therefore using the science of the mind you are able to transform the way you use the science of energy within your body and within your external world, therefore during this time now celebrate the fact that the crone, The High Priestess, is prepared to stand before you and guide you into the realms of the authentic self, to those places where the treasures of you await you. So let us not delay any longer, it is time for you to meet your crone. Close your eyes if you have not already and open your energy to breathe in the light and power of Infinite Source and as you exhale just let go of everything inside your body that may be causing you stress or concern. Every time you breathe in breathe in Infinite Source and breathe out everything that causes you stress and anxiety. Another deep breath in filling all the major and minor chakras in your body with the infinite energy of light and relax. Imagine an exquisite wise old woman manifesting before you. You see The High Priestess qualities inside of her. Looking into her eyes you can see the wisdom, you see the all knowingness that exists deep within her and you are humbled by the power that pours out through her eyes and through her heart, a power that you in fact have been pining for, for many, many years. It is your divine right to realign with this energy consciously. You have earned the right to channel this power into every area of your life regardless of your current earth age. Place the palms of both of your hands against the palms of the crone and feel her energy penetrating the chakras on the palms of your hands moving into your body and simply experience connecting with this part of you. The High Priestess understands the Sacred Language of Nature. She is one with Mother Earth and Father Sky. The Sacred Marriage of the Divine Feminine and Masculine have taken place within her and there is an inner core strength that few have experienced. It is that inner core strength that you are now ready to absorb into the DNA of your current body, and when you are ready take a deep breath in opening your energy consciously and allowing it to move into the cells and into the DNA of your body. This is the power of you balanced in power - Spirit and science in perfect equilibrium. You know your truth, you have embraced many aspects of the authentic self and the world is seen very differently through the eyes of the crone. While this is happening she becomes fluid and begins to become one with you. This fluid energy is able to flow through you unhindered connecting with every aspect of you that needs her light, her wisdom and her power, her maturity on a spiritual and emotional level and she teaches you how to be the wise observer. The energy of The High Priestess settles within your heart chakra. She will teach you the magic of love as expressed through the wise ones. She brings you a greater understanding of unconditional love and it is the combination of these two energies working through you and with you that will bring about great change shattering the illusions, tearing down the shutters, leaving you with only one thing and that is truth, the truth you have called for. Continue to breathe in deeply and exhaling fully as these energies need some time to settle inside of you. Feel the presence of Mother Earth supporting you, the presence of Father Sky overlighting you, watching over you and their energies combined protecting and guiding you. Mother Earth and Father sky work hand-in-hand. You are also being prepared for the energies of the coming of the Sacred God. This is the energy we will be working with next. During this particular time of harnessing the wisdom of the crone you will be in a position to understand your own masculine energy. Right now you are seeing the power of your feminine self, the goddess, the temptress, the warrioress, all of those combined energies, the mother, the maiden, the nurturer, all of this is inside of you and you are discovering which of those aspects are your strengths, which of those aspects are in truth your truth and who you truly are. The moment you accept that and you love yourself as that, you will be able to see the power of your God-self, your masculine self in his truth. Take a moment now to call in any other energies you require at this time to support your healing or your release, whatever it is you choose. Know that during this specific time of the Easter your higher self will choose what you will die to and what you will be rebirthed into. This is being done for the purpose of overriding the lower ego. All you need do is observe what you are going through at that time and you will know, surrender to it and allow it to be. I, Kuthumi, now create a powerful golden shield of light around you. This shield begins projecting vibrations into your body that will support the dislodging of the implant that is connected to the hologram we have spoken of that feeds your fear of not being enough, of not being perfect, not being thin enough, rich enough, pretty enough, intelligent enough. Enough is enough! No more of that! It is now time for authentic beauty to shine through and that is the totality of what the crone represents. In human physical terms she has lost the plumpness of youth yet she is still exquisite, therefore her exquisiteness has nothing to do with her physical appearance and everything to do with her inner beauty, this is why this exercise is so important. Take another deep breath in exhaling fully as the energies now come to settle calmly inside of you. Give thanks to The High Priestess and the crone energy for merging with you. Acknowledge that you have consciously and willingly embraced that core stabilising power of the all wise self represented by the crone and High Priestess. Acknowledge that you have consciously and willingly chosen to become the wise observer and act only at the right moment whether it (you) be the cat amongst the pigeon or the one throwing the cat amongst the pigeons. That is part of the role you are playing at this time. You are the destroyers of the illusion rising in love. The reason why you are rising in love is because you have made the choice not ever to nurture an illusion ever again. Give thanks to yourself for choosing to serve in this manner. It is often considered not an easy position to be in however it is a mighty one to be in because you are the greatest catalysts of change - the shatterers of the old matrix. More and more of you are being called to service now to step in to shatter illusions, to be the catalyst because of the second wave of ascension coming. The less illusion there is the greater chance of more and more souls moving through this gateway. The longer the illusion is maintained the more strenuous and strained the window of change will appear to feel like at the end of this coming year, therefore the less there is to wade through, the less non-sense there is, the easier it is to move through all the levels of your ascension, and every time you have a revelation, every time you have insight and every time you master an aspect of yourself, you ascend. Therefore ascension essentially is a moment-to-moment experience. The ascension wave we speak of is a mass collective process where there is mass insight, revelation, change and the choice to move into another realm or way of living life, each time becoming more simplistic. I want you now to ground yourself in your body and imagine your feet actually sinking into Mother Earth’s body. Imagine her energy firmly connecting with the chakras of the soles of your feet and with the two of you connected in that way. Your processes are divinely supported and Father Sky, the overlighting energy, watches over both of you, holding both of you and bringing everything you need to ensure that illusion no longer distracts you. Know that this energy will stay with you for the next seven days, during this time you are shifting and changing the feminine qualities inside of yourself, connecting on a more conscious and deeper level with your true feminine power and the aspects of femininity that are in truth the authentic you. After that period your energy will begin preparing for the first stage of integrating the God energy, which takes place on the 4th of April. April is a month that brings some of the most forceful energies of change in terms of your external reality. Let me explain this in detail so no one has a panic attack! March is the feminine quality and intensive as it is your attention is within. It is related to the power of the Goddesses, it is related to the Goddesses ability to nurture the inner child, so it is about discovering what is inside of you, what it is authentically, and then in April everything that has been inside of you emerges in your external reality. The masculine force that takes action and things materialise, structures are set in place and what you have been working towards from January up until the 4th of April suddenly takes root, and it may appear that your life is in upheaval but all that is happening is what you have been working with internally is now manifesting externally. Therefore look forward to some truly wonderful change in your life because now the energy is moving, you will have the sense of your life is moving and you can get going. All of this is your choice otherwise you would not be listening to these words or for those who may read these words in the future you have brought this upon yourself because you are ready for it. You have earned this right to know who you truly are, what you are capable of, and the position you are in to make great change. I, Kuthumi, stand amongst all of you and I stand with you alone. I can do this because we are all one and not separate. You are on a journey of taking full responsibility for yourself, owning every aspect of your truth and moving through, cutting through if you must every illusion that distracts you from the truth or tries to convince you that you are dependant on a source outside of you in the form of another human, another belief system, perception, attitude, projection, whatever it is. Listen to your own heart, listen to your instinct and you will always know the truth. Some will try and convince you that I, Kuthumi, and the other Masters are of the dark, if that is case then you know that already and then what are you doing here? If you have ever had an inkling, a strong feeling that we are dark I ask you again what are you doing here? Why are you not honouring your truth? If it is indeed the truth! So beloved ones I will leave you with that one to ponder upon. There is only one very powerful truth that exists that everyone can know and will know, and that is that which exists inside of you, that core part of you, and the more you shed the old ways and focus on breaking out of every matrix in existence that nurtures the illusion then you are heading in the right direction. May the light, the truth and the love of all that is, the highest and purest light, truth and love reveal itself to you and reveal all truth to you and if we are dark as others have said then that truth will be revealed to you too. Either way I love you! Peace and blessings be with you.